Thanks for joining the PAW family! Now that you have your organization listed on PAW, it is important to get support for it. The best way to do this is to reach out to your existing audience and supporters. Once you have reached out to just a few supporters who participate, they will continue to spread the word for you by reaching out to friends and family. (sheltername) has joined PetAdoptWorld! Now you can help raise funds for (sheltername) by adopting a virtual pet on PAW and/or playing games in the PAW Game Arcade. It's free to join and play! Do you need custom code for your website? Email us - shelter at petadoptworld.com. We'll help you out. On your facebook wall, select the LINK option. 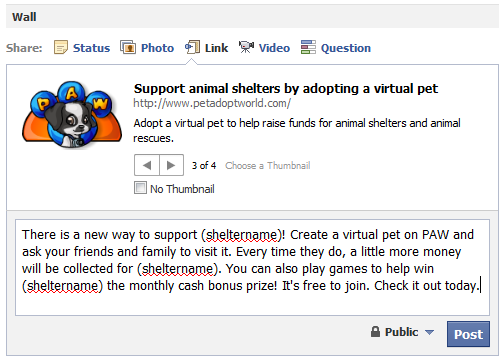 Enter http://www.petadoptworld.com/ in the URL field and click on ATTACH. Select the correct Thumbnail image. There is a new way to support (sheltername)! Create a virtual pet on PAW and ask your friends and family to visit it. Every time they do, a little more money will be collected for (sheltername). You can also play games to help win (sheltername) the monthly cash bonus prize! It's free to join. Check it out today.